Easy on starch, high on quality. Accurate glue sets that deliver just the right amount of glue – job after job. 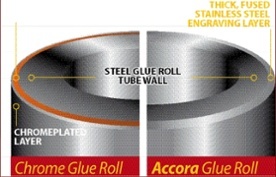 Built tough for longer roll life; built smart to help save on glue costs. Robust materials, outside-the-box design & engineering, and precision manufacturing all merge in Accora glue sets for unmatched performance.